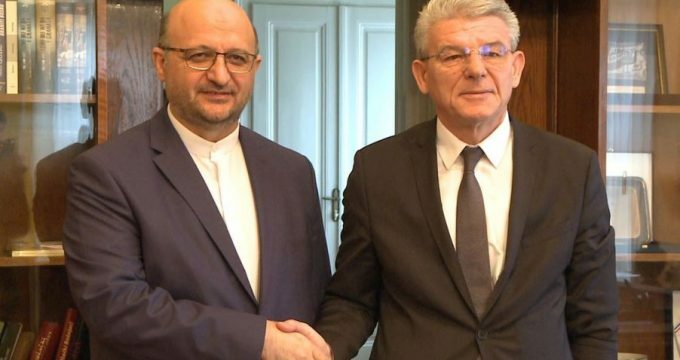 IRNA – Member of Bosnia and Herzegovina presidential council expressed its support for implementation of the Iranian nuclear deal, known as the Joint Comprehensive Plan of Action (JCPOA). Sarajevo sides with the European External Action Service regarding the Iranian nuclear deal, Shafiq Jafarovic said. He made the remarks in a meeting with Iran’s Ambassador to Bosnia and Herzegovina Mahmoud Heydari on Wednesday. The Bosnian official called also for development of all-out ties with Iran. In the meantime, the Iranian envoy for his part congratulated Jafarovic’s victory in Bosnia and Herzegovina election. He referred to Washington’s withdrawal from the Iranian nuclear deal and said the illegal action by the US will only discredit the country. Iran supports stability, sovereignty and peaceful co-existence of all ethnic groups in Bosnia and Herzegovina, Heydari added.